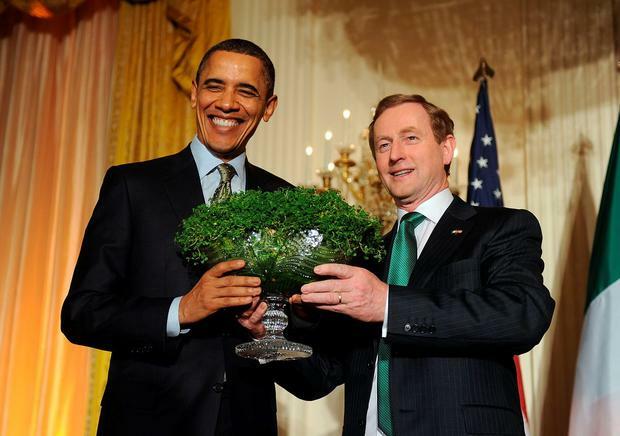 Taoiseach Enda Kenny with US President Barack Obama in 2011 for the traditional presentation of a bowl of shamrock on St. Patrick's Day reception in Washington, DC. Taoiseach Enda Kenny is to make his traditional visit to the White House for St Patrick's Day. The White House said today that the Taoiseach will meet US president Barack Obama on Friday, ahead of the Monday holiday. Mr Kenny's visit starts with breakfast at vice president Joe Biden's residence, followed by an Oval Office meeting with Mr Obama. Then the leaders plan to attend the annual St Patrick's Day lunch at the US Capitol. That evening, the president and first lady plan a reception at the White House. Mr Obama and Mr Kenny will exchange shamrocks in a tradition begun under US president Harry Truman. Mr Biden plans to meet Northern Ireland First Minister Peter Robinson and Deputy First Minister Martin McGuinness separately to discuss progress toward peace.